The technology is used in the whole line of HP printers. It provides printing of e-documents from a mobile device via cloud services. Every such printer has a unique e-mail address, where you should send the docs, you need to print. The administrator of a printer with ePrint technology could accept users, who want to print on it. It means that nobody can use a printer, if he hadn’t got it from the printer admin. There are only two disadvantages of ePrint. First—you don’t have the authority to change printer settings, and second—you can print one document at once. Make sure your mobile device is connected to the Internet. Make sure the needed printer is switched on and connected to the Internet either (even if it is connected to a networked PC). – right on the printer (Wireless connection—Web-service—Show printer e-mail or Settings—Web-service settings—Printer e-mail, depending on the model). Send the needed document from e-mail on your mobile device to printer e-mail. The e-mail will be printed right after receiving. You could check job status on the ePrintCenter site after registration. If ePrint service fails to connect to a printer, the print job will be kept for 24 hours. Images (bmp, jpg, png, gif, tiff). This entry was posted on Tuesday, April 22nd, 2014 at 9:17 am	and is filed under HP, mobile, printing, technology. 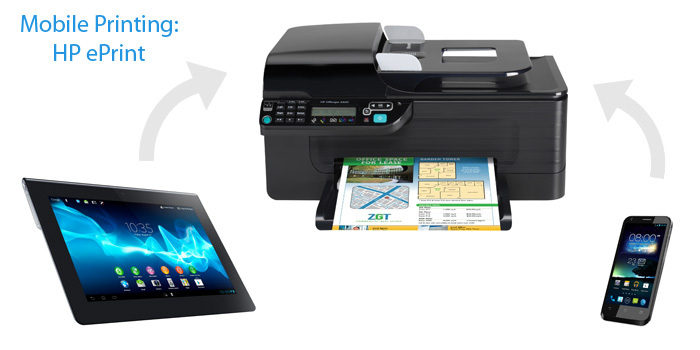 "5 Ways To Print Directly From Smartphone Or Tablet: The Mopria Alliance"